CBS now has a successful superhero TV series to call its own in the form of Supergirl, with Melissa Benoist starring as Superman's cousin, Kara Zor-El - everyday twenty-something Kara Danvers by day, newfound savior of National City by night (and day, when it's necessary). The DC comic book TV show adaptation was quick to expand beyond the Supergirl comics mythology before the first half of season 1 had even come to a close, by introducing the character of J'onn J'onzz aka Martian Manhunter (David Harewood) into the mix as a central character on the series. 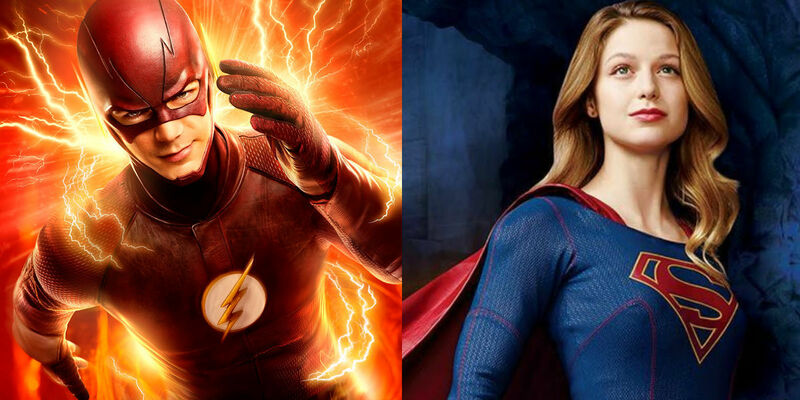 Of course, even before Supergirl debuted on CBS, it was speculated that Kara would eventually cross over into The CW's shared DC TV universe - meeting up with such characters as Grant Gustin's Barry Allen and/or Stephen Amell's Oliver Queen (from The Flash and Arrow, respectively), in the process. Supergirl co-creators Greg Berlanti and Andrew Kreisberg, who are also part of the main creative team behind Arrow and The Flash as well as the CW spinoff DC's Legends of Tomorrow, have since indicated that such a crossover could happen as soon as the second half of Supergirl season 1. "We are so incredibly excited to announce something that we have dreamed of happening since we starting making Supergirl. We want to thank Grant Gustin for making the time to come visit (on top of his already immense workload) and all of the folks at CBS, The CW, Warner Bros. and DC for working this out. It is our pleasure and hope to create an episode worthy of everyone's enthusiasm and support." Right off the bat, though, it's easy to imagine different scenarios for how The Flash and Kara will cross paths. The Flash season 2 has established the existence of multiple realities (aka the Multiverse) on the DC TV show, so it's certainly possible that Barry Allen will meet up with Supergirl on a different version of Earth than the one that serves as The Flash's main setting. The shared world of Arrow and The Flash is one that continues to grow quite rapidly - and even now includes the likes of John Constantine (Matt Ryan) amongst its ranks - so it's feasible that Kara exists in that same version of Earth - and there will be an explanation for why she's not been mentioned before. Legends of Tomorrow has also introduced time-travel into the mix of the DC TV series universe, so there could be another explanation altogether for how Barry and Kara meet (or, rather, when they meet). On a related note - Gustin and Benoist's screen charisma in their roles of Barry Allen and Kara Zor-El/Danvers are very much big selling points for their respective DC superhero TV shows, so that makes the prospect of a Supergirl and The Flash crossover all the more appealing - as the prospect of getting to watch the two interact with one another (and see what happens when their respective good-natured personalities bounce off one another) is one that promises to be fun. If the crossover plays out well, it could lead to bigger things down the road too - but for the time being, it might be best to think of this as a one-shot experience only (featuring two DC series with appropriately similar optimistic and upbeat tones to boot), until further notice. Supergirl will return with “For The Girl Who Has Everything” next Monday on CBS @8pm. The Flash will return with "Welcome to Earth-2" next Tuesday on The CW @8pm. Arrow and DC’s Legends of Tomorrow air during the same time-slot on The CW on Wednesdays and Thursday, respectively.